If you are looking for a tough, reliable.low maintenance plant, then Dietes are one to consider. Sometimes called the ‘Wild Iris’ or ‘African Iris’ a number of species have become popular as landscaping plants. A common feature is the evergreen strap like foliage, the leaves stand stiffly upright, and over time the plant will form a dense clump. They spread slowly by underground rhizomes and will out compete most other plants without being invasive. You will not find many weeds in a clump of Dietes. Drought tolerant, able to cope with heat as well as cold, however not great in frosts. They are excellent for growing in areas that are difficult for other plants and for positions where you want a really low maintenance plant. 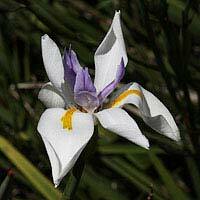 The flowering habit is interesting, Dietes produce a flowering stem, seperate to the foliage. Once established, these plants require little care. However after 5 – 6 years, the clumps can become congested and need a tidy up. Best grown in full sun in a well drained soil. Water in well when planting and through the first summer. D. grandiflora is reasonably drought tolerant once established. Flowering period – Summer to autumn however will spot flower through the year. The best way to do this is to dig up the whole clump and divide them. Try watering them well first to make digging easier. You can remove almost all of the old foliage, and then replant the rhizomes in soil that have been renewed with some compost and manure. Used widely in commercial landscaping Dieties are popular because they have good flowers, good foliage and are almost indestructible. No green thumbs need for this hardy plant. Although a number of species are available, it is Dietes grandiflora that is most popular in cultivation. Tall growing with green lance shaped leaves. Grown both for the foliage and the bright flowers that appear from spring through summer. 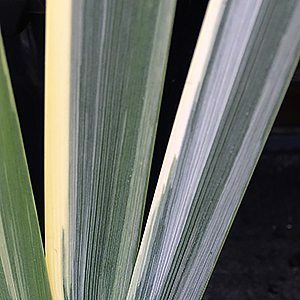 D.iridioides (African iris, Cape iris) including the variegated form . Dietes are used widely as a low growing ground cover plant. D. Grandiflora will flower from spring through to summer and is a very hardy plant that will reach 1m in height. Originally from South Africa they are widely used in roadside plantings. D. grandiflora is sometimes referred to as the ‘Wild Iris’, D. iridioides is known as the ‘fortnight lily’. Most species are native to South Africa however D. robinsoniana or ‘Wedding Lily’ is a native of Lord Howe island.